New findings may offer novel ways to treat pancreatic cancer. Researchers at New York University (NYU) School of Medicine may have figured out how ravenous pancreatic tumor cells feed themselves, according to a study published in the prestigious scientific journal Nature. Identifying this nutritional mechanism could open new doors for cancer treatments. In many cancers, including pancreatic, a mutated version of a protein called Ras helps drive tumor cell growth and cancer progression. These Ras-mutated cells need extra nutrients to finance their accelerated growth, but until recently scientists didn’t fully understand how they met their food requirements. 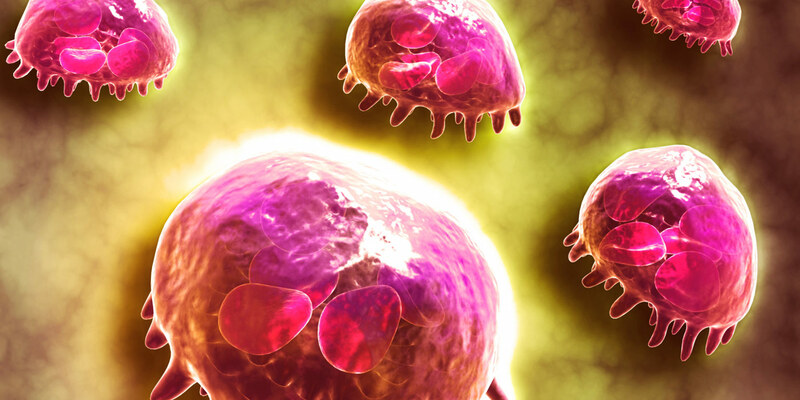 In the Nature study, led by Cosimo Commisso, a postdoctoral fellow in the Department of Biochemistry and Molecular Pharmacology at NYU School of Medicine, the researchers showed that cancer cells with a specific Ras mutation known as KRAS use a feeding method called macropinocytosis. This mechanism allows the cells to devour an abundant natural protein called albumin. The tumor cells then dismantle the albumin for amino acids, which are necessary for the cancer cells’ growth. During macropinocytosis, a large fluid-filled sac called a macropinosome is pinched off from the cell membrane and brought to the interior of the cell, where its contents, including nutrients, can be used by the cell machinery. Alternatively, researchers might leverage this uptake mechanism as a way to get tumor cells to take up anti-cancer drugs, by fooling them into devouring chemotherapies or novel treatments along with albumin.